I love it when films try to do something different. Especially genre films, which can easily get lost in the mix with so many similar releases. But what is it that makes a horror film, for example, really stand out among its peers? Living Among Us is a film that dares to do something different. At first glance, you might say it is a “found footage” film, in the vein The Blair Witch project. But the film stars many recognizable faces like John Heard (Home Alone, Big), Thomas Ian Nicholas (American Pie, Rookie of the Year) and William Sadler (The Shawshank Redemption, Bill & Ted’s Bogus Journey). You can’t spin it as found-footage, because the characters are clearly actors. However, it does resemble another sub-genre that I love – the “mockumentary,” if you will. I first fell in love with the concept with 1992’s Man Bites Dog, a brilliant film about a documentary crew that follows a serial killer as he goes about his daily “work.” Another great film, even closer with the horror genre, is 2006’s Behind the Mask: The Rise of Leslie Vernon. In that film, a camera crew follows a slasher type of villain (similar to a Jason, or Michael Myers) as he terrorizes a small town. Those two are must-sees for any film or horror buff. Which brings us to Living Among Us, directed by Brian A. Metcalf (The Lost Tree), which employs a similar technique that I find fascinating. A news crew is sent by their boss (James Russo) to cover the story of modern day, self-proclaimed “vampires” who are facing controversy for the way they acquire their blood. The team of Mike (Thomas Ian Nicholas), Carrie (Jordan Hinson), and Benny (Hunter Gomez) are sent to make a documentary that will show the vampires in a positive light. The entire film is comprised of only news reports and “documentary” footage. What really makes the film work is the slow-build, and the anticipation that something bad is going to go down. It opens with new reels covering the vampires, and an interview with their leader Samuel (Sadler) justifying their means of existence and dispelling negative claims about them. The text then appears on the screen, “This documentary is dedicated to those who gave their lives to bring you this footage.” So we know that some bad stuff is about to go down. The question is – what, and to whom? The filmmakers do a good job of building up the characters, and covering their bases when it comes to how all the footage will be captured. Many films that pull similar antics usually end up with impossible shots for the equipment they bring with them. Yet in Living Among Us, there is a scene early on where the crew goes over all their equipment and shows us exactly how they are going to cover everything. And the great part is with modern technology, even the tiniest wireless cameras are completely believable. It’s hard to go into exactly what happens without giving away too much of the movie, so I will leave you to experience it for yourself. However, I will say that it is a slow build that definitely pays off. For fans of horror, this movie is a lot of fun and gives you what you want to see. I won’t say how, but things get crazy. And then they get crazier. But you never know quite when, and it’s fun to guess along with the documentarians in the story. Speaking of the film crew, all three of the main characters are great at escaping into their roles. I saw Thomas Ian Nicholas in person at Wizard World earlier in the day where I saw the film, but his portrayal of Mike is much different than anything else I have seen him in. He plays the often abrasive leader of his group, who remains skeptical of the vampire family. It is fun watching him take on horror – especially not long after seeing him play Walt Disney. He shows his versatility, and you can tell he and the rest of the cast were having a lot of fun. Jordan Hinson is Mike’s assistant Carrie, who he also has been dating for several years. The two of them are captured arguing quite a bit, in a very believable troubled relationship. Hunter Gomez plays their cameraman that captures their fighting, along with most of the footage for the film. Gomez is fantastic in the role, playing the young and naive journalist who is eager to be involved. Casting for the vampires is absolutely terrific. The patriarch of the family is Andrew, played by the late John Heard. It is always a pleasure to see the actor on screen, and is really fun to see him play such a unique role. Heard is intimidating and mysterious as you try and guess his intentions with his new guests. Serving as the matriarch of our vampires is the wonderful Esmé Bianco as Elleanor. You may remember her as Ros from Game of Thrones, but you surely won’t forget her in this film. She plays a delightful host for our characters, and only gets better as the plot progresses. Chad Todhunter plays the quiet and creepy son Selvin, who never has a shortage of uncomfortable stares and body language. 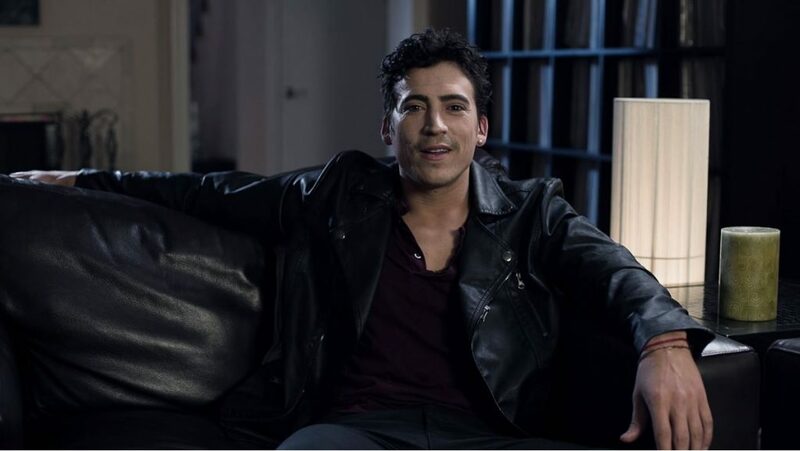 Although all of the vampires are great, the standout has to be Andrew Keegan as Blake. You’ll recognize him from films like 10 Things I Hate About You and Independence Day, and several television shows from the ’90s. But I’ll never forget him as Zack in 1994’s Camp Nowhere. Keegan has a manic energy that never ends, as he so desperately wants to use the documentary to become a celebrity. He’s constantly looking for reassurance on how he looks, and trying to get the crew to film more footage of him. The actor is always charismatic and believable as Blake, and really helps ramp up the dark comedy when the time comes. Living Among Us certainly lives on the horror spectrum, but isn’t constrained by any particular set of rules. The film explores the lore and myth of vampires – silver, garlic, crosses included – but also approaches things from a scientific standpoint. The way it takes these conventions and spins them on their heads, along with the faux-documentary style, makes for a lot of fun. Sure, there is some camp – and the film isn’t perfect – but horror fans will eat it up faster than the vampires… eat their dinner. I’ll let you find out what’s on the menu for yourself. Living Among Us is now playing in select theaters around the country, and is also available on VOD.